Roundabouts are one of the most effective intersection control treatments available with the added benefit of calming traffic. They limit vehicle speeds to approximately 20 mph and can control vehicle speeds on four streets simultaneously. 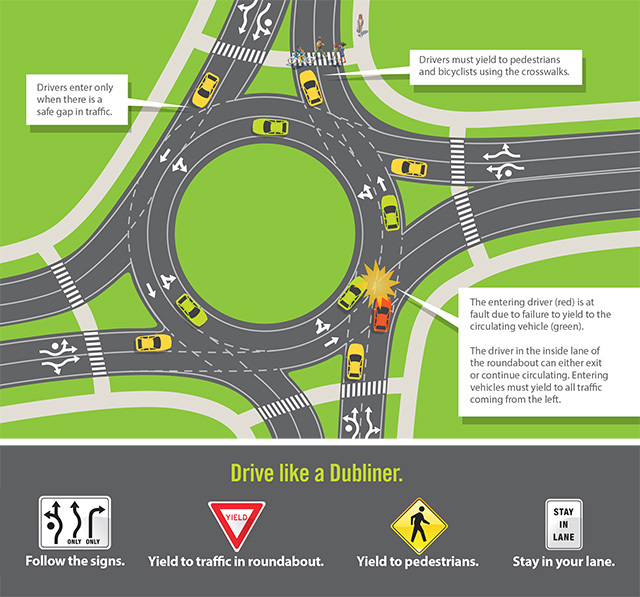 Roundabouts typically reduce crashes by 40 – 60 percent, reduce injury by 35 – 80 percent and almost completely eliminate incapacitating injury and fatal crashes. Roundabouts have proven to be much safer than traffic signals. The projected injury crash rate for roundabouts is half that of traditional signals. Additionally, Dublin’s proposed roundabouts would be able to accommodate traffic volume growth in the area through 2025 compared with the programmed traffic signal with minimal turn lanes, which would accommodate through 2009. There are two basic premises in which roundabouts achieve crash reductions of 40 to 60 percent when compared to traffic signals and greatly reduce severity on those few crashes that do occur. One is the simple decision making and the second is the low level of conflicts. At a four-way intersection there are 32 possible conflict points between vehicles and only eight at roundabouts. Pedestrians face six conflicts when crossing only one leg of the road whereas at a roundabout they only have two.